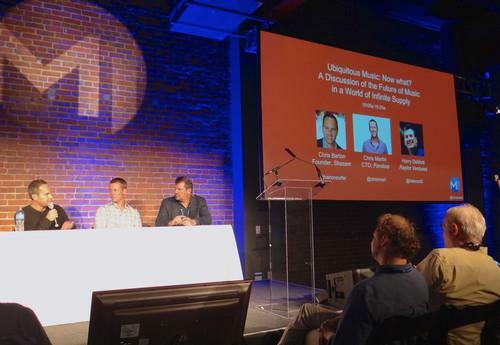 Chris Barton, founder of Shazam, left, and Chris Martin, middle, CTO at Pandora, spoke about the future of music at the M1 mobile summit on Nov. 13, 2014, with Harry DeMott of Raptor Ventures. "We're sitting on a gold mine of music and metadata relative to what people like and don't like. If we can continue to mine that, that's our opportunity," said Chris Martin, chief technology officer at Pandora. "Pandora is still in its adolescence," he added, speaking during a panel discussion at the M1 mobile summit in San Francisco Thursday. Pandora now has about 45 billion pieces of thumbs-up and thumbs-down "like" data, which helps to determine the songs the app plays for users. That's been the foundation of Pandora's app, but it's a model now threatened by other apps like Spotify, Rdio and Beats Music, which provide other ways to help people consume and find music. The competitors' services include user customized and outside curated playlists. But building up data around the song itself is important, and Pandora remains committed to using feedback signals from users, Martin said. That's what will allow the company to continue to provide personalized playlists for users, he said. At the same time, Pandora now has around 1 million pieces of music in its app that are manually curated, he said. Human-made playlists are a big element in Apple-owned Beats' service. Pandora is also eyeing opportunities to get its service into a greater variety of devices as the Internet of Things grows, said Martin in an interview following the panel discussion. The upcoming Apple Watch is one possible device, and other connected devices in the home, he said. Pandora's app can be added now to other devices like the Ouya gaming console, and cars. "It's about ubiquitous music," Martin said. Pandora says it has about 80 million active users.